For the Creative Book Club…. 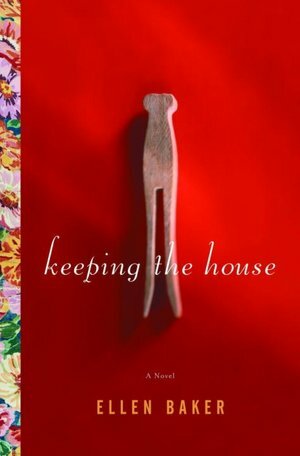 A couple of weeks ago, I wrote a book review for Keeping the House by Ellen Baker. If you’re looking for some creative ways to make your book club discussion of this book fun and interesting, I have gathered some ideas to make it festive! As a member of a book club that has been meeting for 15 years, I know that sometimes finding a good book for discussion can be a challenge. So, that’s why I’m suggesting this book as your next selection. You will be talking about a wide variety of things…. The role of women in the early-to-mid 1900’s; the impact of both World Wars at home and abroad; the way small town life can be a blessing as well as a curse; the importance of communication in a marriage; and the way things have changed as well as how they have stayed the same! First of all, head over to Ellen Baker’s website for some excellent background of the book including great discussion questions as well as some fun recipes from the book. I think the recipe for Dolly’s Lacy Raisin Wafers would be perfect! 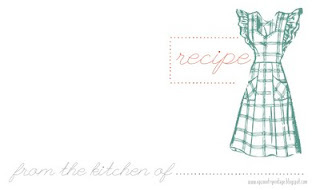 In fact, take a look at these free recipe-card printables. Wouldn’t it be fun to print out the recipes on these cards and give them as favors to your guests? Sift flour, soda, salt, cinnamon, nutmeg. Rinse and drain raisins; mix with salad oil, water; mix in sugar, vanilla, oats, nuts, then flour mixture. Refrigerate 1 hr. Start heating oven to 350 degrees F. Drop dough by teaspoonfuls, about 2” apart, onto greased cookie sheet. Bake 10 to 12 min., or till crisp around edges. Makes 3 ½ doz. Are you feeling extra crafty? Perhaps you could get some of these cute clothes-pins from Etsy, or make some using this tutorial, and add a magnet to the back so your guests can display their recipe cards at home. 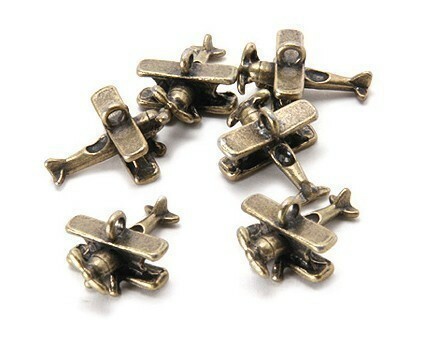 How darling would these be, holding your recipe cards nestled next to your table settings? When it comes to setting the table, there are so many great options. Aren’t these dishes great? 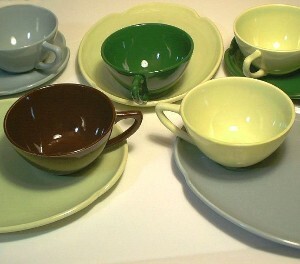 You can pick up lots of retro dishes at thrift stores, of course. Perhaps your relatives have some to borrow. I know my mom has some really great pink melamine coffee cups and saucers. (I wonder where they are….) These lovely ones are available online. I have a co-worker who collects vintage tablecloths, and once in awhile I run across one at a thrift store for a good price, but they are a little hard to come-by. Maybe you have one waiting for a good excuse to show it off! (Since Dolly is a member of the ladies’ sewing circle working on a quilt throughout the novel, you could also cover the table with a quilt!) One of my favorite bloggers, Dottie Angel, is a master when it comes to finding and re-purposing vintage linens. I wish I had this one for book-club! In fact her blog is full of inspirational ideas that would be perfect for this book-club gathering! 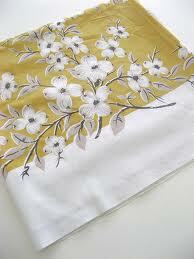 Her dishes, her linens, her aprons… Go visit her site now! I can’t think of anything more fun than having each book-club member join-in the theme by arriving in a vintage-inspired apron. The cover of paper-back version of the book, with its colorful apron, is so charming! 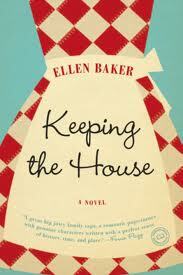 Most ladies will have a lot of fun finding an apron to wear to book-club. 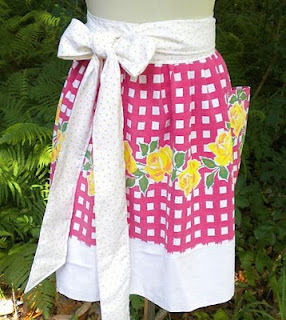 Check out the inspiration for vintage aprons like this one. Finally, I adore the idea of using graphics for display that include cover images of the magazines and journals quoted in the book. If you can get color copies of covers from Ladies Home Journal or Good Housekeeping, place them around the house along with some of the quotes from the book that you type-out and print on vintage inspired paper. I just love this picture of a ladies sewing circle from a vintage magazine. It looks almost exactly how I envisioned it in the book. Or how about this picture of a wife happy in the kitchen? I found it on an article entitled: From a 1950’s high school home economics textbook, teaching girls how to prepare for married life. Take a look at the suggestions given, and find a way to print them out and incorporate them into your creative book-club gathering! My favorite? #7 Make him comfortable: Have him lean back in a comfortable chair or suggest he lie down in the bedroom. Have a cool or warm drink ready for him. Arrange his pillow and offer to take off his shoes. Speak in a low, soft, soothing and pleasant voice. Allow him to relax and unwind. Finally, in the novel, Dolly was so determined to be the perfect wife that she ended up resenting the fact that she couldn’t follow her dream to fly an airplane. By the end, we are happy that Dolly will fulfill that wish. Encourage your book-club members to follow their dreams and “fly” by giving each one a mini-charm to remind them that they have wings! The sky’s the limit (no pun intended) with your creative book-club for Keeping the House! If you try some of these ideas, please send me a note and a few pictures of your festive gathering!